Locate adjustment screw on backside of main forearm. 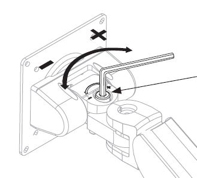 If arm is dropping increase tension by turning adjustment screw counter-clockwise. If arm is raising decrease tension by turning adjustment screw clockwise. 3. Confirm the monitor meets the specifications of the Conform or Poise Heavy Duty arm; Conform HD: 17-40 lbs., Poise HD: 18-42 lbs.